Nakakainis ba ‘pag may unfair treatment tuwing nag-cocommute? Glutamax spends millions for ads reinforcing colonial beauty. Then blame society bec the beauty standards they helped create are unfair. You buy from them bec of pressure. They profit, spend millions for ads that reinforce the standards. This is actually true coming from a woman who has been tagged as negra since birth. But instead of pulling brown women down, GLUTAMAX why don’t you promote skin confidence instead?! The first statement, which doubles down on the notion that using whitening products to subject oneself to colonial beauty standards is somehow empowering for women, only shows how the brand has completely missed the point of their critics. When the statement received criticisms of its own, the brand then posted another statement with an apology included. Meanwhile, the Ad Standards Council of the Philippines (ASC), which screens and regulates advertising materials across all media, released a statement on Monday that the controversial ads were not approved. “ASC stands for responsible communications and abides by a strict code of ethics,” the statement read. 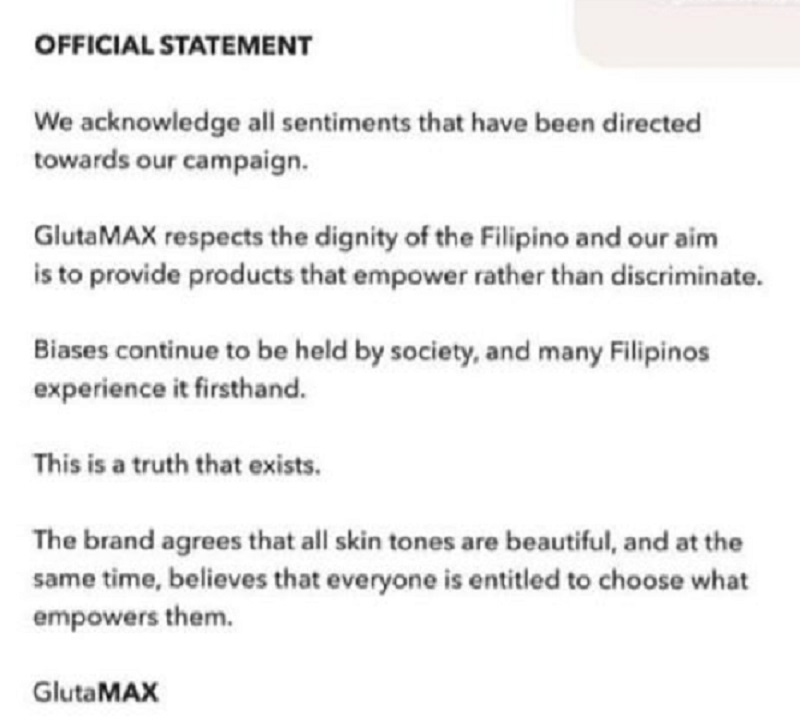 “In connection with the recent GLUTAMAX skin care digital and outdoor ads, the materials posted and displayed were not approved by ASC. Article IV Section 1 Item A. of the ASC Code of Ethics on DISPARAGEMENT states that: “Advertisements shall not directly or indirectly disparage, ridicule, criticize, or attack any natural or juridical person, groups of persons, or any sector of society, especially on the basis of gender, social or economic class, religion, ethnicity, race, or nationality. “The posting of a disapproved material is in violation of the ASC Manual of Procedures. The matter will be dealt with in accordance with the rules and regulations as stated in said Manual,” it added.